we chat a bit about life and health. Then we start to dig into details. Inevitably we end up talking nutrition. Because what you eat and how you eat it determines a lot for your health, especially your hormones. Over 13 years of working with clients, I have discovered that what you eat regularly influences your resiliency. I thank one of my bodywork teachers for raising my awareness of the key role of resiliency. I was in a particularly hard place and battling a nasty flu. I was feeling fragile because I had this belief that as a practitioner, I shouldn’t get sick. She told me, “Kristin, it’s not that people aren’t going to get sick. It’s how they bounce back that determines their health”. Now that got me to thinking. Your “bounce back,” your rebound, your resiliency. Whatever you want to call it, it ultimately determines the lion’s share of your overall health. Nothing feeds your resiliency like the right food. Foods that stabilize your blood sugars. Your body hates drama. Over time, the highs and lows of sugar-induced peaks and crashes will break down your resiliency. It’ll beat up your pancreas and leave your adrenals exhausted. Eventually it’ll even fatigue your thyroid. It’s not pretty and I don’t recommend it. Imagine how your resiliency could grow if your engine consistently ran smoothly, because it was getting the right fuel. Imagine how your body could repair without having to expend valuable energy trying to mop up the damage done by those silly ups and downs. I guarantee, your body would thrive. You’d have more energy to play with your kids. You’d be more focused at work. You’d be happier with yourself. Chances are, you’d be happier in general. So here’s the big question. You get it. 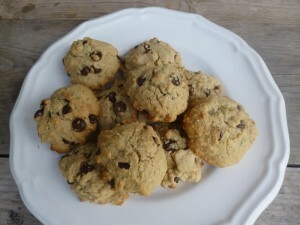 Balancing your blood sugar sounds like a great plan, but sometimes, you also really want a chewy, gooey, hot-out-of-the-oven chocolate chip cookie? Go ahead and make them with almond flour and arrowroot, and double the eggs. More protein will help reduce the sugar spike. When you make your own, you’ve got control over the ingredients. I think you’re going to love these cookies. They came out of the best baking session with my daughter. I swear we made magic with this recipe. Oh golly, I want to hear from you. Tell me your favorite chocolate chip story. Who did you make them with? And what did you have with them? If you don’t like chocolate chip cookies, then what’s your favorite sweet treat? I’d love to hear all the warm-hot-gooey details. If you’re ever a little bored during the winter, you must stop by our house. We churn out the celebrations like nobody’s business. In February we celebrates the kids’ birthdays and our anniversary. And in March, we round out the celebrations with Jim’s and my birthdays. It’s a lot of candles and all things “sweet”. And of course, I’ve mastered just about every alternative dessert from “chocolate” dipped strawberries to vanilla cupcakes.. When Jim requested a banana cream pie to celebrate his big day, I nearly croaked. I’ve never made a banana cream pie (nor even tried one) in my life! I searched all my favorite sites [Against All Grains and The Nourished Kitchen], and I finally landed on Elena’s Pantry. Elena is kind of like a gluten-free Martha Stewart. She’s got easy, go-to recipes that are fun to switch around. My only advice when working with her recipes is to halve the sugar and replace grapeseed oil with melted butter. All in all, she’s got my vote and I usually use her formulas as a base.